The Alfred Hitchcock stories of Robert Edmond Alter. A few months ago, Steve Lewis asked me to write a little about Earle Basinsky, Jr.’s short fiction. While that particular experiment didn’t reap many benefits for me (to be fair, it’s not Steve’s fault that Basinsky couldn’t write his way out of a pay toilet, at least in terms of his short stuff), the idea stayed with me. Rather than review one or two particular issues of a zine, I could jot down my thoughts on the output of a singular author. So that’s what you’re about to read. For this initial installment, I’ve focused on a largely-forgotten writer and his entire contribution to Alfred Hitchcock’s Mystery Magazine. The man himself remains an enigma. According to the few bios I’ve been able to find, Alter wrote fourteen children’s novels – but, in a search on the net, I recovered more than fourteen titles, so were there retitles? – three crime novels (also in question) and a science fiction novel (Path to Savagery, Avon, 1969) which was made into the truly wretched movie THE RAVAGERS in 1979, starring Richard Harris, Ernest Borgnine, and Art Carney. Which is interesting since books and short stories by Alter continued appearing into 1970! It is only a conjecture at this point, but a general consensus among the people Steve and I have asked is that either an agent or his estate (or both) were very efficient on his behalf after his death. Alter’s first AHMM story, “To Catch a Big One,” (August 1958, 5250 words) concerns scuba-divers, territory that Alter had mined the year before in a story published in Argosy, “The Dark Dive” (September 1957). In “Big One,” Bent and Mason are divers that hire their boat out to thrill-seekers Harvey Wolfe and his amorous wife, Lorry. While Mason shows Wolfe the art of avoiding poisonous coral and exploring shipwrecks, Bent stays aboard to show Mrs. Wolfe a few things. In the end, Harvey isn’t as ignorant of the dangers of the water as he might seem. Something waited for Bent on the other side of the horizon: something with a soundless voice called to him. I thought of that every time I saw him alone on the deck of our schooner, as he watched the sea with brooding, unsatisfied eyes, his face a dark pool of intensity, every splinter of thought reflected there like a dart of light. I don’t know where it might have ended, but it doesn’t matter now; Harvey Wolfe saw to that, Harvey and his wife Lorry. Alter’s next three stories for AHMM were nowhere near as enthralling as his debut. The first two of the three, “An Accident Has Been Arranged” (March 1959, 3000 wds) and “The Assassin” (September 1959, 3000 wds) are cut from the same cloth: bumbling hitman, in a case of mistaken identity, stalks the wrong guy. In the former, Kenneth Morgan is lucky to land passage on a tanker to Sydney but finds his luck has turned sour when he becomes the target of a political assassin. In the latter, “The Assasin” is hired to bump off an important Englishman, not realizing his intended victim has pulled a no-show. Neither story shows much enthusiasm. Alter merely relates incidents rather than investing them with any tension or, worse, believability. The obligatory twists at the climax are forced and tired. “It Couldn’t Possibly Happen” (November 1959, 2250 wds) continues the political intrigue introduced in the previous two entries. Mr. Marsh is entrusted with important classified documents by a dying secret agent. When the agent’s killer shows up demanding the papers, Marsh promises the man that if he lets Marsh live, he’ll stall the police long enough for the killer to escape out the balcony. After the agent falls to his death, Marsh remarks that he never promised the guy that he had a ... I can’t tell you, but a funny twist saves this short-short from being unremarkable. “Each Night He Pulled the Trigger” (May 1960, 3250 wds) finds Alter once again balancing good writing, characterization (at least as good as you can get in a short story), and riveting suspense. Every night, to the dismay of his friends and fellow soldiers, Captain Ortega cracks his pistol, loads one shell, and plays a deadly game of Russian Roulette. His young bunkmate tries in vain to talk the officer out of putting the gun to his head, but to no avail. When another soldier comes to the camp and accuses Ortega of being a deserter, the Captain elevates the game. I’m surprised this story wasn’t made into an episode of Hitchcock’s TV series since it’s got all the earmarks of a Hitch show. After killing a politician, two assassins drive a hillside road mapping out their escape route. One of the killers opts to foot it, fearing that he’ll be caught by the police if he stays with his partner in the car. They plan to meet up at the yacht that’s been sent to retrieve them. Their separate treks don’t come easily. That’s the gist of “Schedule for an Assassination” (August 1960, 3000 wds), a hodgepodge of humor and dead-serious intrigue that works for all the same reasons that made “Each Night He Pulled the Trigger” such a good read. The only drawback with “Schedule” is its length – this feels like a small piece of a bigger story. The assassination itself, explained away in bits, would have added even more suspense to the mix. But Katov had said nothing. He’d thought how odd it was that he’d just killed a man, and then immediately had bumped into a woman who was bringing a new life into the world. I suppose that’s what makes the balance, he’d thought. But Vologin had been right. They should have killed her. “Double Trouble” (April 1962, 3500 wds) is about as close to fluff as Alter ever wrote for AHMM. By fluff, I mean an “easygoing mystery,” something one could read over tea before a fire, rather than the intense, politically-motivated plots that Alter had become known for. Mr. Darby is tired of his rich, overweight wife after two years of servitude. He believes he’s owed a lot more than just a roof over his head. He wants that sack of dough his wife has hidden away. Darby knows where the sack is located and makes a quick dispatch of his wife with pillow and .22. What he doesn’t bargain for is a nosey neighbor who literally “sets her watch by the man’s comings and goings.” Those readers finding themselves drifting towards “cosies” would probably find a lot to like in “Double Trouble,” but I like ’em quite a bit darker. There was a pause as she stared at his eyes, as she took in breath to say it with a rush. And in that brief moment they were the only two people there – man and wife, parents. Alter returns to the theme of the assassin in “A Habit for the Voyage” (February 1964, 5250 words), a well he may have dipped into a few times too many. Killer-for-hire Krueger is on board a Brazilian steamer, his mission to eliminate a fellow passenger. When near-accidents befall Krueger, he realizes who the true target may be. The old “hunter is actually the hunted” tale is taken out and dusted off again, but Alter overlooks quite a few cobwebs. “Habit” is not just cliche but, worse, boring. The author must have sensed that he needed a change of pace and “Echo of a Savage” (June 1964, 5000 wds) is very definitely a change of pace. Eschewing his usual backgrounds of steamer ships and exotic lands, “Savage” takes place deep in the heart of the Okefenokee Swamp. Three violent goons have held up a bank and headed into the swamp, where they run across the shanty-boat of Jube, an old man content to live among the copperheads and gators. The robbers hold Jube hostage and take over his boat, but the swamp man has other ideas. “Echo of a Savage” is the extreme opposite of “A Habit for the Voyage”: a breezy, entertaining read with more than a dollop of darkness thrown in. 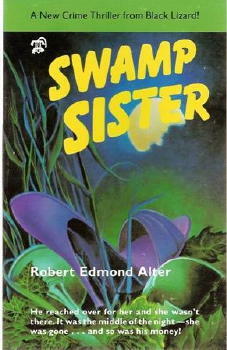 The story has a lot in common with Alter’s Swamp Sister, the Gold Medal novel written a couple years later. After a lay-off of nearly two years, Robert Edmond Alter returned to the pages of AHMM with three appearances in 1966: “Haunted Hill” (April, 4500 wds), “The Shunned House” (May, 5000 wds), and his final AHMM story, “No Place Like Home” (December, 3000 wds). The first two stories are a continuation of Alter’s locale switch from exotic to “backwoods.” Both fall into the “faux haunted house” mystery sub-genre. In “Haunted Hill,” Flem Trubb owes everyone in town, but comes into a little cash after he sells his land to a lumber mill. Several of Flem’s neighbors remark that he shouldn’t be carrying around so much cash, but Flem laughs at danger. Sure enough, the hillbilly disappears, returning as a ghost to haunt his hilltop home. Not much surprise in its reveal, but the story is enjoyable and has a nasty kick in its rear. “The Shunned House” almost comes off like one of the “Alfred Hitchcock and the Three Investigators” series of books created by Robert Arthur in the early 60s (with such great titles as The Mystery of the... Silver Spider, Whispering Mummy, Stuttering Parrot, Coughing Dragon, etc.) but, like “Haunted Hill” (which also sounds like a Robert Arthur story, come to think of it), has too dark an edge to be a kiddie story. “The Shunned House” in question is the old Yost House, home, so the legends say, to a priceless cache of gold. Three boys, Joe, Phil and Harold, are determined to find the treasure, but when Harold disappears in the house’s basement, the fun turns to fear. Two things separate this story from the “Three Investigators” series (and most Boy’s Life stories, for that matter): the boy who disappears turns up dead and, in a plot twist that fascinated me, the story picks up years after the murder and the two remaining boys are now adults. Phil is now working in the county D.A.’s office, investigating the brutal murder of Joe, his body found in the same area as Harold’s years ago. “The Shunned House” is a riveting suspenser, Alter’s best for AHMM. It’s a shame that “The Shunned House” wasn’t Alter’s swan-song for AHMM. It would have allowed him to go out on a high note. That can’t be said for “No Place Like Home.” Couch potato Jeffrey lives with and off of his grandmother, who disdains everything he does. The feelings are mutual, and Jeffrey lives for the day when grandma tsks her last tsk and leaves him the house, her money, but most importantly, her sofa and TV set. Jeffrey’s golden oppurtunity arrives when he reads about an elderly woman who burns to death after falling asleep while smoking. This is one of those “Ha-Ha, we gotcha with the last paragraph” stories that filled the pages of AHMM from the 1950s through the 1970s. A lot of those stories had ironic, funny gotchas. This one doesn’t. Though it’s an awful story, one thing can be said: it’s another indicator of just how varied Alter’s writing was. The reader would be hard pressed to guess that the author of “The Shunned House” also wrote “No Place Like Home” (or “Echo of a Savage” or “Schedule for an Assasination” either, for that matter). ROBERT EDMOND ALTER: A BIBLIOGRAPHY, by Peter Enfantino, Victor Berch & Steve Lewis. Listed first are the stories from Alfred Hitchcock’s Magazine that Peter discussed above, then Alter’s full-length fiction, excluding his children’s novels. Next the remainder of his short crime and adventure fiction. There are undoubtedly many gaps in this latter section. Many of the magazines his work appeared in has not yet been indexed, nor are they particularly easy to find. Additions and/or corrections are, as always, very much welcome. 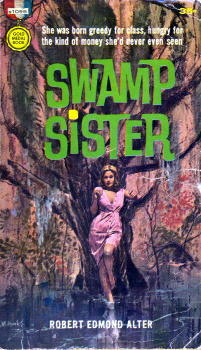 Swamp Sister. Gold Medal s1095, pbo, March 1961. Black Lizard/Creative Arts, pb, May 1986. Vintage/Black Lizard, trade pb, March 1993. 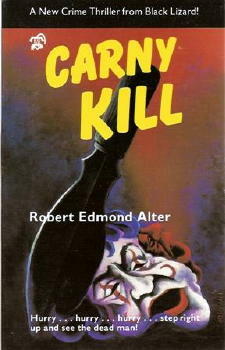 Carny Kill. Gold Medal d1611, pbo, 1966. 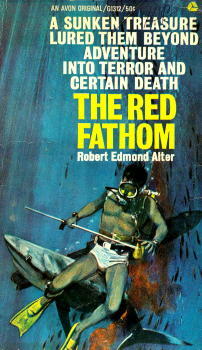 The Red Fathom. Avon G-1312, pbo, 1967. 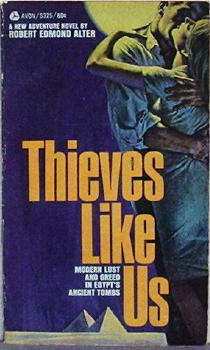 Thieves Like Us. Avon S325, pbo, 1968. 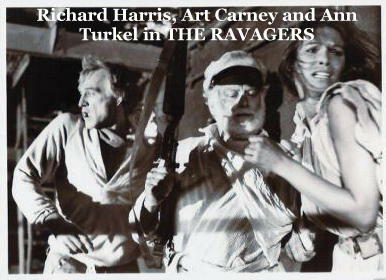 - The basis for the movie THE RAVAGERS, 1979, Ernest Borgnine, Art Carney, Ann Turkel & Richard Harris. 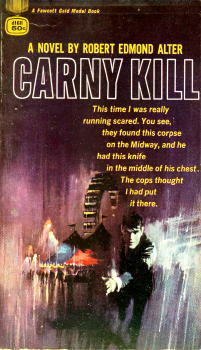 “I,” Said the Fly, September 1965 (expanded into the novel Carny Kill, Gold Medal, 1966). Man in Gray, June 1966, as by Robert Retla.